With a starting price of $899, MacBooks don’t come cheap. Still, Apple’s laptop lineup is undoubtedly the best in the industry. You get sleek and sturdy aluminum designs, excellent keyboards and touchpads, long battery life and an easy-to-use operating system that keeps your files in sync across multiple Apple devices. Owners of iPhones will appreciate the ability to take calls on their Mac and send and receive text messages. Our top overall pick for the money is the 13-inch MacBook Air ($999) because of its long battery life and strong performance from its 5th-generation Core i5 processor. But if you’re willing to splurge on a sharper and more vibrant screen, the 13-inch MacBook Pro with Retina Display ($1,299) is a fantastic choice. That said, other MacBooks have unique strengths of their own. There’s some pretty significant differences between the assorted members of the MacBook family, which includes the new 12-inch MacBook, two MacBook Airs (11- and 13-inch) and two MacBook Pros (13- and 15-inch). You’ll find a wide range of processor options, storage capacity and ports. Here’s a breakdown of every MacBook and how they compare in terms of our test results to help you choose the right model. The new 12-inch MacBook is so compact and light some people mistake it for an iPad when they see it closed. And it’s very easy to carry, because the MacBook weighs just 2.03 pounds and measures 0.52 inches at its thickest point. The 11-inch Air is a close second at 2.4 pounds. However, keep in mind that the MacBook offers only a single USB-C port, which means you can’t charge the notebook and plug in another device at the same time (like the iPhone) without using a dongle. While still relatively light, the 13-inch MacBook Air is about a pound heavier than the 12-inch MacBook, and it’s considerably taller and wider (partly because of its large screen bezel). The 3.5-pound, 13-inch MacBook Pro is somewhat hefty given its screen size, but it makes up for that with beefy performance and a great display. The 4.5-pound, 15-inch MacBook Pro is among the lightest in its class of 15-inch notebooks. The updated 13-inch MacBook Air is one of the longest-running laptops, period. It lasted an epic 14 hours on the Laptop Mag battery test, which involves continuous Web surfing over Wi-Fi. The 13-inch MacBook Pro is no slouch, though, lasting a little more than 12 hours on the same test. The 15-inch MacBook Pro’s 9 hours of endurance makes it one of the longest-running laptops with that size display. Although the new 12-inch MacBook offers above-average battery life, other ultraportables last longer unplugged, including the 11-inch Air. There are MacBooks with Retina Displays, and there are those without. You’ll notice a huge difference in terms of resolution and color quality. For instance, the 13-inch MacBook Air has been stuck at a fairly low 1440 x 900 pixels for several years, while the new, smaller 12-inch MacBook sports a 2304 x 1440-pixel panel. So even though the MacBook has a smaller screen, it offers a sharper picture and seems larger than it is. The 13-inch and 15-inch Retina MacBooks have even sharper screens at 2560 x 1600 and 2800 x 1800 pixels, respectively. The 15-inch display looks so sharp that Apple ditched the 17-inch MacBook Pro from its lineup. Having this sort of resolution makes it easier to put two windows side-by-side without losing detail. However, while the 15-inch MacBook Pro has a higher resolution than the 13-inch Pro, the former didn’t fare as well in color reproduction, accuracy or brightness. The 12-inch MacBook has a sharper display than the 13-inch Air, as well as more saturated colors and better contrast. Whether you’re watching videos, flipping through photos on Facebook or editing in Photoshop, color gamut is an important metric, as it measures how much of the sRGB color spectrum a laptop can reproduce. Close to 100 is ideal, but some notebook screens surpass that figure. The 12-inch MacBook notched 102 percent on this test, but the 13-inch Retina MacBook Pro was fairly close behind with a mark of 91 percent. 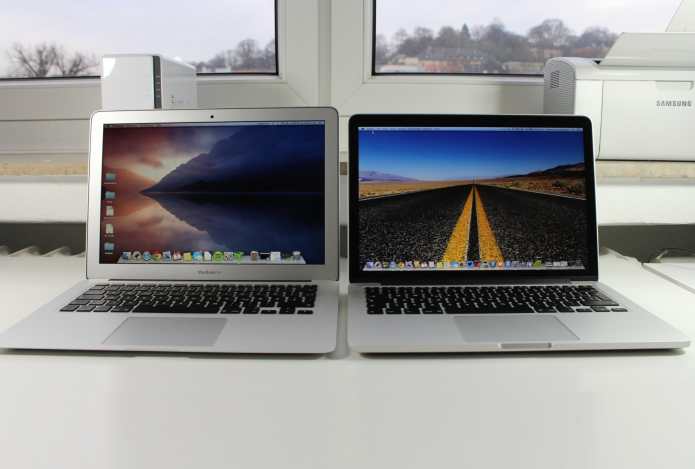 Both MacBook Airs posted less than 70 percent, which is relatively poor these days. All Apple laptops offer above-average screen brightness, but the 13-inch MacBook Pro is at the top of the class, registering 389 nits on our tests. That beats the 12-inch MacBook and 13-inch Air. The 11-inch Air pumps out a lot of brightness for its size, though, registering 370 nits. If you work on photos or video editing, color accuracy is paramount. Our Delta-E test measures this attribute and returns a number score, with 0 being perfect. Both the 13-inch Retina MacBook Pro and 12-inch MacBook notched 1.2, which is excellent, but the 15-inch model wasn’t far behind at 2.1. The 13-inch MacBook Air brought up the rear with 4.3, which is worse than the laptop category average. If you like to plug more than one peripheral at once into your laptop, you’ll want to avoid the new MacBook, as it uses a single USB-C port for both power and connecting other devices. You’ll need a $20 adapter to attach your iPhone or any other USB gadget. Want to get power and connect a peripheral and display at the same time? That will be $80 for another dongle. Between the 13-inch Air and 11-inch Air, we give a slight edge to the 13-incher because it offers an SD card slot. Otherwise, both pack two USB 3.0 ports and a Thunderbolt 2 port for connecting a display. The MacBook Pros have the most ports because they have the most room on their chassis, adding another Thunderbolt 2 port and HDMI to the above assortment. Creative pros and power users who are willing to invest two grand in a laptop need look no further than the 15-inch MacBook Pro. The combination of its quad-core Core i7 CPU and optional AMD R9 M370X graphics smoked all other Mac laptops in various tests. However, the 13-inch MacBook Pro offers very good performance per dollar. On Geekbench 3, which measures overall performance, the 15-inch MacBook Pro more than doubled the score of the 13-inch MacBook Pro. Nevertheless, the 13-inch Pro’s score of 7,113 is considerably higher than other 13-inch laptops, like the Dell XPS 13 (6,374). The 13-inch Air’s Core i5 CPU and speedy SSD paced it to a fairly good score of 5,780. The 11-inch Air, which has similar components, scored a slightly higher 5,800. The Core-M powered MacBook is no speed demon, however, as its score of 4,631 is barely above the ultraportable laptop average (4,567). Another key measure of an Apple laptop’s performance is its flash storage, as it determines such factors as app open times and the ability to quickly load and browse large libraries of content. To gauge this performance we copy a batch of mixed files and time the results to arrive at a speed rating in megabytes per second (MBps). Once again the 15-inch MacBook Pro obliterated every other Mac with a score of 636 MBps, thanks to its next-generation PCIe technology. Nevertheless, the 13-inch Air and Pro both performed well at over 350 MBps. The 12-inch MacBook turned in an above-average score of 254 MBps, while the 11-inch Air brought up the rear. This is why you splurge for the 15-inch MacBook Pro. The AMD Radeon R9 M370X graphics in the $2,499 configuration makes quick work of photo and video editing, making this machine the best choice for creative pros. On the OpenGL portion of Cinebench, which measures graphics performance, the 15-inch Pro notched 62.5. That’s more than double the next fastest MacBook, the 13-inch Pro (28.9). It’s important to note that the 13-inch model doesn’t have a discrete graphics option.The 11-inch and 13-inch Air were pretty neck-and-neck, but the 12-inch MacBook turned in the lowest score on this test. It helps to think about the family of Mac that will meet your needs before you choose a specific model. The Air is for those who want swift performance and long battery life in a lightweight machine for a reasonable price. Power users and photo and video editors should step up to the 13- or 15-inch MacBook Pro, which offer very sharp Retina displays along with beefier processors in heftier designs. While more expensive, the 15-inch Pro is really the only choice for those looking for workstation-class performance. The 12-inch MacBook is a niche system. It’s the most portable choice in Apple’s lineup, but it also costs just as much as the 13-inch Pro (which offers more speed and a bigger display) and it’s $300 more than the 13-inch Air (which has more battery life and ports). So get the MacBook only if you want to travel really, really light. For the vast majority of shoppers, the 13-inch Air continues to be the best choice, but the 13-inch Pro is a close second because of its better screen.